A lucky find in a Mexican market turned into a new design career for Alice Eichelmann, who knew the handcrafted palm hat she discovered would be perfect for anyone who enjoys life in the sun. Alice traced the hat to a remote Mexican town where the villagers have been weaving hats out of palm leaves for more than 400 years. Palm is a sustainable fiber that’s pliable enough to shape into many different hat forms and durable enough to hold its shape without unraveling. Alice began collaborating with the villagers, who now do the weaving, sewing and shaping of her meticulous designs. Tula hats provide broad coverage from the sun (they’re rated UPF 50+), and the natural palm fibers create a breathable fabric so you won’t feel overheated. Alice’s designs range from traditional to contemporary, and she has a knack for tweaking timeless silhouettes and adding details that flatter. 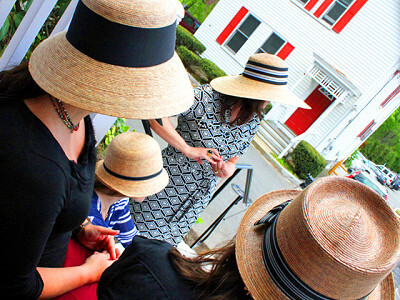 In the garden, at the beach and all around town, your Tula hat will deliver enviably stylish sun protection. Hello from Austin, Texas. I started Tula Hats 22 years ago while living in Mexico City. After buying a hat in a market I realized that with a few design changes that others would also appreciate this sun protection. My hats are handcrafted in a Mexican village that has been producing palm hats for over four centuries. We have been honored to work with such a wonderful group of people and have developed a special friendship and trust with the hat makers. Looking forward to connecting with you via Daily Grommet! How do I measure to see if I am a small, medium, or large size? @ Bob - I will pull the information here as well. It's always good to have it in more than one place. 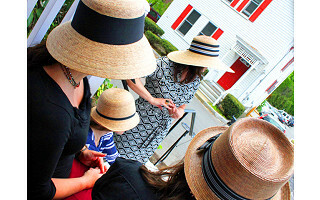 **Chloe, Somerset, Dakota, and Gardener Hats were all made with a stretchy band on a larger mold, and can accomodate more head sizes. These hat styles appear in more than one column. How to measure for your Hat size:The easiest way is to hold a piece of string and measure around your head where the hat will sit (about an 1/8” above the forehead and ears). Then place the string next to a tape measure and compare to our hat sizing chart. If your measurement falls between sizes, choose the next largest size. If you pull the string too tight or hold it too loosely you won’t get a perfect fit. You can size a hat down with sizing tape. Sizing tape is included in individual orders. @ Ronna Hello Ronna. The Chloe hat has a comfort stretchy band on the inside so that style may work for you. That type of band accommodates more than one head size. You cannot add additional sizing tape on the hats with the stretchy band. My mother uses the sizing tape all around here Tula Hats. That sizes it down one size. @ james What a great testimonial. Thanks for stopping by! @ james Thanks for the kind words. I really appreciate that! The Ryder hat appears to be the only one shown for men. 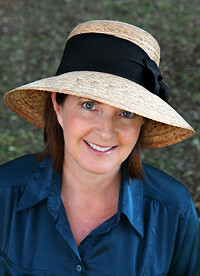 Unfortunately, it has a brim that would seem not to offer much "shade" for the face, given its narrow width, compared to the many offerings for women which offer more than ample protection for the face (and even the back of the neck, an area often overlooked when purchasing hats that offer sun protection). Do you offer any hats for men with a much wider brim style? @ Carleton - Even though we have them pictured on ladies, the Ranch, the Gardener and the Dakota are all unisex styles. And the Ryder, well that one's not just for men! 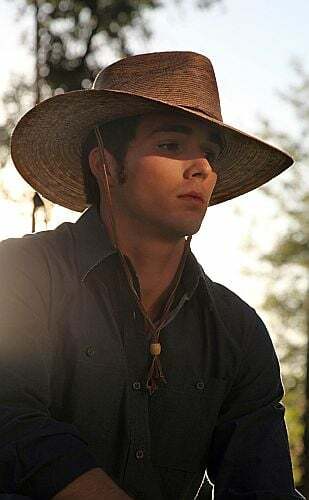 @Katherine Klinger The Unisex Styles for men are Gardener with a 4" Brim, Ryder which is more of a causal fun hat, and the Dakota Western style. The guys love our hats because of the natural look and feel. @ Carleton - Here is a picture of the Gardener on a guy. Very handsome. Are these hats packable? I like the cowboy style, but wonder if it travels well. @ Janice Palm is very pliable and can be packed. Just stick it in your suitcase with items of clothing in and around the crown. They are very durable! The Daily Grommet video has a snippet of a hat being packed. And I know from experience because I usually cram about 3 in my suitcase. The video shows you at the Mexican village factory. Which style hat are you wearing? Thanks! Will Chloe comfortably fit a size 7 1/2? @ Dion A 7 1/2 is XXL or 23 1/2" when you measure around your head using the instructions on the detail tab. The Chloe would be too small. The only style we have in XXL is the Gardener. How much is ahipping on these hats, plz? I would like to purchase the newport. My head measures 22.5 in. Would this hat fit? @Julie Hello Julie, The newport runs a bit big so I think that it would fit you. I measure 22" and it is big on me. I have to add sizing tape to make it fit for me. We just tried it on Nicole and she wears that style and measures 22 1/2" So yes! Thanks so much! I am a three time survivor of Melanoma and am always looking for attractive hats as I HAVE to avoid the sun. I plan on buying a Gardner and a Newport. Thanks again for your helpful response. do you think you will get them in a extra large size. My daughter wears a man sized hat and cannot find a "one size" hat to fit her. @ Laura Altes The Gardener is available in XL and XXL See the image of a woman wearing the Gardener Style under the video clip. My head seems to measure 22-3/4. It's a shame that none of your more feminine styles are big enough. All the unisex styles look too manly to me. I would love to buy a Chloe. If you ever decide to offer women's hats in sizes that fit more women, I would love to buy one. @ Nikki: Your feedback is important to us, thank you! We'll be sure to let you know when the 22-3/4 size is available. @Chew-Hoong, I would like to "throw my hat in the ring" in support of large hat sizes for women! I have been searching for years for feminine hats in size 7 to 7 1/2. Once I find that company, I will spend lots of money! A lucky find in a Mexican market turned into a new design career for Alice Eichelmann, who knew the handcrafted palm hat she discovered would be perfect for anyone who enjoys life in the sun. Alice traced the hat to a remote Mexican town where the villagers have been weaving hats out of palm leaves for more than 400 years. Palm is a sustainable fiber that’s pliable enough to shape into many different hat forms and durable enough to hold its shape without unraveling. Alice began collaborating with the villagers, who now do the weaving, sewing and shaping of her meticulous designs.